When it comes to picking out the best microwavable dishes, material is everything. However, it is important you also find dinnerware that is going to hold up to the daily abuse of being stabbed with a knife, thrown in the dishwasher and stacked on top of each other. And, besides being microwavable, a dinnerware set should be made with durable material. So, the first question is, what is the best material for dinnerware? Well, according to Zola, all dinnerware is made out of ceramic. However, there are variations. And, these variations include Porcelain, Bone China and Stoneware. The good news is, these materials can be used in the microwave as long as metal trim does not adorn it. Therefore, this is not only good news, it’s great news! This opens the door for a wide range of options. So, the next step is deciding which material works best for your household. Porcelain and Bone China are lightweight and delicate to the touch. However, both of these materials are extremely durable, chip resistant and non-porous. Whereas, Stoneware tends to be heavier and bulkier. In addition, it is more prone to chipping and it is slightly porous. So, most of our final picks for best microwavable dishes are constructed of porcelain. And, porcelain dinnerware has all the qualities for the everyday, microwavable dinner plate. Like we just mentioned, porcelain dinnerware is non porous, chip-resistant and extremely durable. Furthermore, it is thin and light, which adds a touch of elegance. And, not to mention, less bulk for the cupboard and dishwasher. Did we mention dishwasher? Yep. 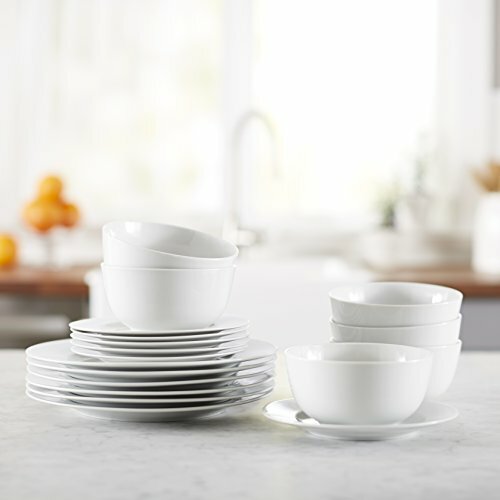 Porcelain dinnerware is dishwasher safe and oven safe. Therefore, porcelain dinnerware is truly a well-versed material. So, now that material is out of the way, the next thing to look for is size. Microwaves come in all sizes, from small to commercial size. Consequently, the dinnerware will need to fit within the microwave. Therefore, when choosing the best microwavable dishes, you will want to pay close attention to the size. Now, that all being said, we are excited to announce our list for the 6 best microwavable dishes. These final picks range from classic to modern in design. And, they are white or variations of white! White is the perfect color for dinnerware as it is a classic and well-versed color for every kitchen. Furthermore, white dinnerware is fun to add to. If you want a pop of color, you can add patterns and designs as you grow your dinnerware collection. This first pick for best microwavable dishes has a fantastic design. It’s a little bit of modern, classic and traditional all wrapped into one. And, this dinnerware set can transform from an everyday set to a dinner party set without any hassle. The Red Vanilla Everytime White 24-Piece Dinnerware Set is constructed of porcelain. And, like we mentioned above, porcelain is a great material for the everyday, microwavable dish as it is chip-resistant, non-porous, durable and dishwasher safe. Furthermore, the Red Vanilla Everytime White 24-Piece Dinnerware Set is oven safe. However, it is recommended on low oven temperature only. And, thankfully, this dinnerware set is lead free and cadmium free. This 24-piece dinnerware set comes with 6 dinner plates, 6 salad plates, 6 soup bowls and 6 mugs. The dinner plates measure 11 inches in diameter, the salad plates measure 8.5 inches in diameter, the soup bowl measures 7.75 inches in diameter and the mug has a capacity for 12 ounces of coffee. The Red Vanilla Everytime White 24-Piece Dinnerware Set has a nice weight and a nice feel. Therefore, these dishes are not too light and not too heavy, just right. In addition, these microwavable dishes are extremely durable and strong. Lastly, the color is great. It is a creamy white, so, there is no starkness to it. These dishes are fairly large in size. Therefore, make sure they work for your household and fit in the microwave. Furthermore, the plates are large with a small base. This can easily cause an accident and the plate can tip rather easy. So, be especially aware around the little ones. Mikasa has a long history of making quality dinnerware sets at a reasonable price. So long, that they have been producing ceramic dinnerware since 1948, which is over half a century. The Mikasa Cheers 16-Piece Dinnerware Set is made of high quality porcelain. And, this is a great material as it is ultra durable, chip resistant and non porous. Furthermore, this 16 piece dinnerware set comes with service for four. The dinner plates are 10.5 inches in diameter, the salad plates are 8.25 inches in diameter, the bowls are 6.25 inches in diameter and it comes with 12 ounce mugs. And, if you are looking to mix and match or are looking for dinnerware with a black and white pattern, this Mikasa Cheers Dinnerware Set also comes in black dot and stripe patterns. You can find that particular set here. Lastly, the microwavable dinnerware set is dishwasher safe. This is a fun, everyday set. The dinnerware is white on white with alternating patterns. Therefore, it will add a touch of whimsical elegance to your dinner table. In addition, the Mikasa Cheers 16-Piece Dinnerware Set is heavy in weight, therefore, they will stay grounded. And, these dishes are ultra durable. We talked a bit about lead and cadmium in dinnerware. And, Mikasa exceeds or meets the federal standards when it comes to lead and other contaminants. However, this doesn’t guarantee this dinnerware is lead or cadmium free. Therefore, we do caution against this product for the mere fact it may contain contaminants. So, if you are looking for a completely cadmium and lead free experience, the Red Vanilla Everytime White 24-Piece Dinnerware Set is a great set to consider. We owned a set of Corelle Dinnerware in a previous life. And, would we ever own a set again? That would depend on our situation. If we needed something extremely reliable and basic, sure. If we needed something just to get us by before we spend the money on our dream dinnerware set, yes. And, that is a very non-hesitant yes. Corelle Dinnerware is ultra durable. So durable, you can throw these and they won’t break. Well, they might, however, you have got to throw these pretty hard. So, what makes Corelle so durable? These dishes are constructed of triple-layer, tempered glass which is break resistant and chip resistant. Furthermore, tempered glass is four times as strong as ordinary glass. And, just to give you an idea of how strong tempered glass is, glass shower doors are constructed of tempered glass. Glass shower doors have to be extremely strong in slippery situation in order to prevent injury. Therefore, these plates are made with three layers of tempered glass. And, we can’t stress this enough, these plates are strong. 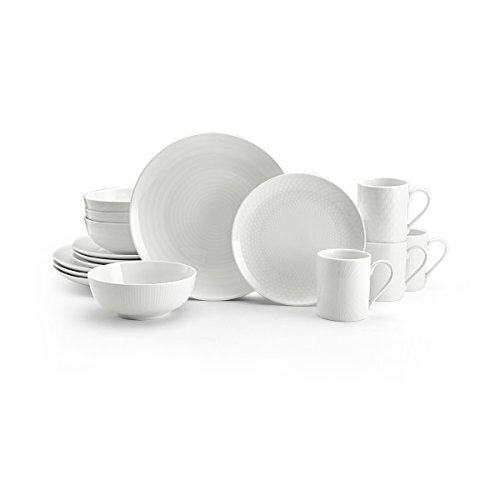 The Corelle Dinnerware Set comes with 18 dishes. This includes 10.25 inch dinner plates, 6.75 inch salad plates and 18 ounce bowls. However, there is the option of a 16-piece or a 20-piece set if you would like to add the mugs. This pick for best microwavable dishes is ultra light and space-saving. The plates and bowls are thin, and take up minimal space in the cupboard and the dishwasher. And, did we say dishwasher? Yes, these dishes are dishwasher, oven and microwave safe. Corelle Dinnerware is extraordinarily durable. Therefore, this is a great option if you have little ones in the home. In addition, these dishes are lead and cadmium-free. While these dishes are virtually unbreakable, if you drop a dish just right or throw it hard enough, it can break. And, if a dish happens to break, it can break into a million little pieces. Furthermore, with our set we had, a couple of the dishes were warped upon arrival. However, instead of returning them, we decided a little character wasn’t such a bad thing. So, we kept them. Although, it’s important to note, most consumers have not had this issue. Lastly, don’t expect a beautiful set of dishes. However, you can expect a highly functional and space-saving set. This set of dinnerware for best microwave dishes is absolutely gorgeous. 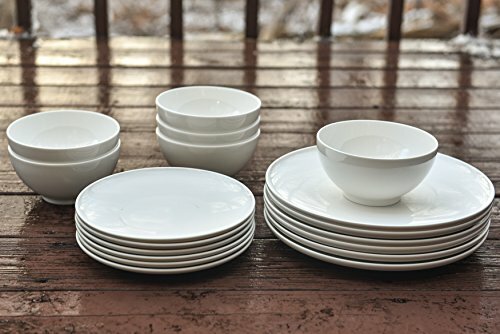 The Pangu 16-Piece Porcelain Dinnerware Set is handmade and features an organic look and feel. This dinnerware set is made of porcelain. And, like we mentioned previously, porcelain is a great choice for dinnerware as it is durable, chip resistant and non porous. Furthermore, this particular porcelain is fired at extremely high temperatures, therefore, it handles very well in the microwave. The Pangu 16-Piece Porcelain Dinnerware Set comes with 4 dinner plates, 4 salad plates, 4 bowls and 4 coffee cups. The dinner plates measure 11 inches in diameter, the salad plates measure 8 inches in diameter, the bowls measure 7 inches in diameter and the cups hold approximately 12 ounces of liquid. Lastly, this dinnerware set is cadmium free and lead free. And, it is dishwasher safe. The Pangu Porcelain Dinnerware Set is made with absolute quality with a design to match. In addition, this dinnerware set is lightweight with a durable feel. And, the bowls are wide and shallow. This makes for a better presentation when serving. The dinner plate size is 11 inches in diameter. And, this is on the larger size of the spectrum. So, be sure that it will fit in your microwave. This is the budget pick on our list. However, you would never know from the look or feel. 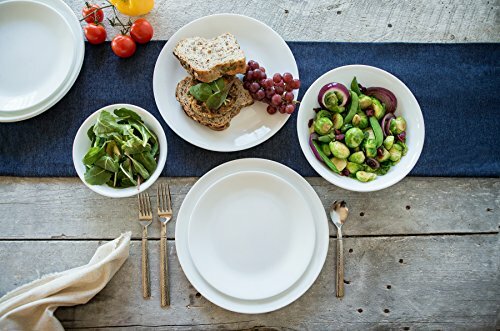 The AmazonBasics 18-Piece Dinnerware Set is made of AB-grade porcelain. And, AB-grade porcelain is a high quality porcelain and is lead free. Furthermore, because this dinnerware is made of porcelain, it is chip resistant, non porous and ultra durable. This dinnerware set is microwave safe, oven safe, freezer safe and dishwasher safe. In addition, when using this dinnerware in the oven, it can withstand temperatures up to 572 degrees Fahrenheit. The AmazonBasics 18-Piece Dinnerware Set features service for 6. The dinner plates measure 10.5 inches in diameter, the salad plates measure 7.5 inches in diameter and the bowls measure 5.5 inches in diameter. You can’t really beat this set for the price. And, the dishes have a good weight to them and feel much more expensive than they are. Lastly, many consumers state these clean up easily. There are quite a few reviews stating these don’t stack up evenly. Therefore, you can expect some variations from plate to plate. In addition, this dinnerware set is not a bright white, yet, more of a grey white. And, there is a large logo placed on the bottom of the dishes. Our final pick for best microwavable dishes is a simple, yet, elegant choice for everyday dishes. And, since they carry a minimal design, they will also work well for entertaining. The HomeTeks Dishware Set is made of porcelain. So, like the other picks on our list, this dinnerware set is non porous, chip resistant and is extremely durable. Therefore, as long as you don’t drop them, they should stay in tip-top shape. However, unlike our other picks, this dinnerware set includes 2 serving platters and 2 serving bowls. And, it comes with 8 dinner plates, 8 salad plates, 8 appetizer plates, 8 cereal bowls, 8 dessert bowls and 8 mugs. 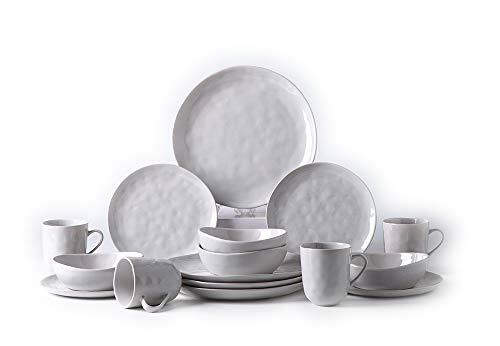 So, if you are looking for a full set of dishes, this dinnerware set comes with 52 pieces and is definitely one to consider. And, the HomeTeks Dishware Set is microwave and dishwasher safe. This dinnerware set has a classically modern design and can go with every type of decor. Furthermore, like we mentioned above, it can work for everyday dishware and formal dinnerware. In addition, the HomeTeks Dishware Set has a good weight and feel to it. Lastly, this dinnerware has quality materials and construction. This pick for best microwavable dishes can get a bit hot in the microwave. So, be sure to use hot pads when removing the dishes after cooking. And, this dinnerware set comes with 53 pieces. Therefore, this could be a lot more than some want to bargain for.